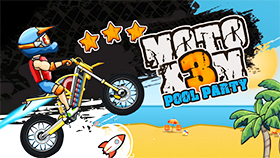 If you are a big fan of motor bicycle, you will love to try the ultimate Driving game named as TG Motocross 3. The game serves an easy gameplay with amazing graphics. In this game, you will control a Racer who is driving through hard mountain of rocks. With different stages which are located in various locations, you will love to discover them all and enjoy the fantastic game world of TG Motocross 3. Each stage in the game includes more than six tracks for you to dive deeply in the amazing races. You only have three chances of being alive in the game, when you run out of them, you will be brought to death and the game is over. 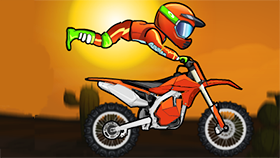 TG Motocross 3 rewards you with scores and it depends on how good you perform during the gameplay. The game serves you an amazing gameplay and you will love playing it. Now it’s time to rock the game of TG Motocross 3, let’s tighten your helmet and try hard until you are the winner of the game. Everything is in your hand, don’t be sad if you are not successful at first. Come and play it now! Press ↑ and → at the same time to climb steep hills. Press ↑ and ← at the same time to gain extra speed. 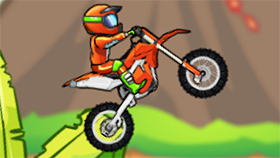 If you have played TG Motocross 3, it’s hard to say no to the unblocked version of the game on Freegames66.com. This version of the game promises you the core features, everything is so much better when you come to play it. 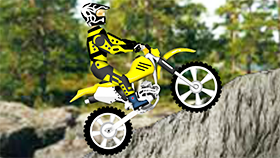 Let’s come to the site now and have even more fun with thousands of amazing games like TG Motocross 3!